Equipping your bike with the right kind of tires is just as critical as choosing the best brake pads, battery or transmission components. Choosing your wheels depends on the type of bike you ride as well as your typical terrain and riding style. Take a look at these top five picks for ATVs, commuter motorcycles, cruising and touring machines, scooters and dual-sport bikes. Utility ATVs easily take on any terrain, thanks to this tire’s tread design, durability and puncture resistance. This workhorse scores also high marks among cheap ATV tires and comes in both 4-ply and 6-ply editions. Pirelli’s Diablo Rosso models, especially the Rosso II and Rosso III, bring together key traits critical for urban commuter riding. Excellent traction and handling on both dry and wet pavement come from the tire’s large footprint area, high-performance silica compound materials and unique tread pattern. The Dunlop American Elite is a top favorite among cruiser and touring bike riders, designed explicitly for high-mileage riding. Its tread offers reliable grip on both wet and dry roads while a laterally grip compound on the shoulders deliver exceptional handling. 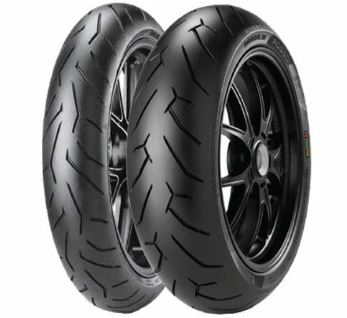 Tracking down scooter tires can be tricky, but the Michelin Power Pure SC is a solid performer loved by riders. These sturdy tires offer a quiet ride and are crafted with a special center tread compound for extra durability. Pirelli’s Scorpion MT90 A/T is built for smooth, agile handling on the street while standing up to gravel and hard pack on off-road trails. With a tread pattern fabricated with large central knobs, the Scorpion also provides stability at high speeds. BikeBandit.com’s inventory features high-quality motorcycle tires for sale along with parts, accessories, tools and other gear. Visit BikeBandit.com to outfit your machine and get fast, free shipping on orders over $99.